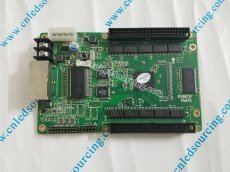 Linsn RV801F or RV801-D LED display receiving card has been out of production for a long time. We still have some pieces in stock! By point correction support single point, 2X2 points, 4X4 points and 8X8 point four correction mode, the biggest calibration 6144 points/module, red, green, blue each level of 256;By card (cabinet) used to display the between the correction of off-color correction, red, green, blue each level of 256. Intelligent identification procedures can identify double color, full color, virtual, lighting, etc all kinds of various drivers board scanning mode and various kinds of signal, the recognition rate reached 99%. According to the situation of the display, customers can arbitrarily set from no gray to level 65536 (64 K), make your screen to achieve the best display effect. set arbitrarily from 10 Hz refresh rate-3000 Hz, phase lock function to make the screen refresh lock the computer monitor refresh rate in integer times, put an end to the image rent, ensure perfect image reappearance. Phase lock synchronous range of 47 Hz-76 Hz. The A and B two ports of receiving card can be used to input or output, can be used for two computers to control a screen at the same time, when one computer have problems, another one automatically replace it, also can be used for one computer with double cable control, when one cable has problems, another one automatically take it over, making the normal work of screen to get maximum security. display, independent broadcasting, can be through the shortcut key, fast switching. A level 256 automatic adjustment function make display brightness adjustment more effective. If the screen receiving card program needs to be upgraded, need to open display power and update through the LED studio, no need to detach receiving card from the display. No dial code switch design, all Settings through the computer. Receiving card integration test function, need not take send card can test display, slash, gray, red, green, blue, and the light, etc many types of test mode. Maximum transmission 170 meters (measured), ensure transmission 140 meters.